Automatically send custom surveys to end users. Learn how your help desk is performing. 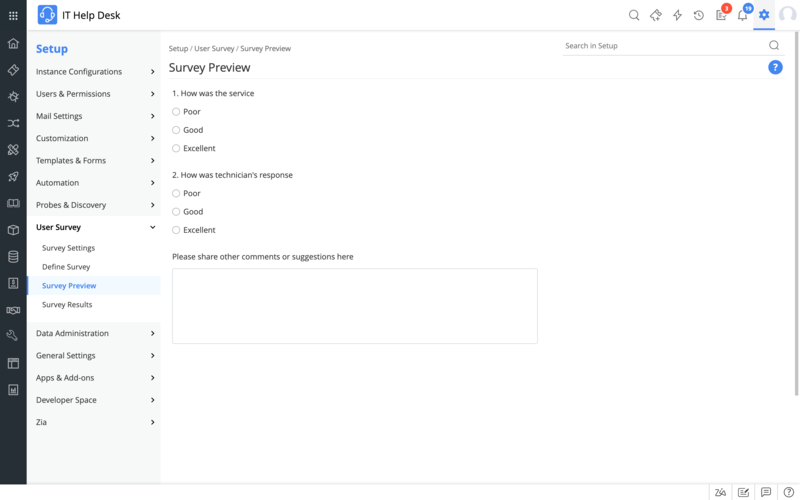 Create custom surveys for end users in minutes with a flexible drag-and-drop canvas. Get the right information from users using ratings, opinion scales, yes or no questions, radio buttons, and other types of questions. Target specific audiences based on request parameters like priority, category, and department. Send surveys in multiple languages. Schedule surveys based on custom frequencies, or automatically send surveys after a certain number of tickets are closed. Generate reports on user survey results—including individual or multiple surveys—to easily assess the performance of your help desk.